If you’ve been following me on Twitter or FaceBook or reading my blogs, you know that I will not hesitate to hop on a plane and go party in my favorite fete city – Toronto. 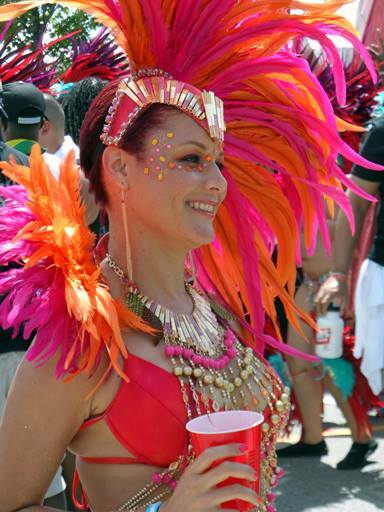 Naturally, I had to head to Caribana…wait, Scotiabank Caribbean Carnival in Toronto. The promoters, deejays, and artists all advertised the events that were to be held from August 1st to August 5th and the revelers seemed excited to play mas on Saturday. So, with all of this excitement in the air, how is it that the highlight of the carnival weekend, the street parade, was so tame? Friday night kicked off with a free Kerwin DuBois concert at Nathan Philips Square. Nothing beats a free concert… except a free Kerwin DuBois concert. “Possessed,” “I Am Soca,” and “Bacchanalist” had me wining and screaming. How can someone so little cause such a commotion? I kept it light that night so that I would have energy to walk and wine on the road the next morning. After what I experienced on Saturday, I realized that I didn’t need to save my energy. Last year, I paid the $25 to enter the grounds and walk alongside the masqueraders and watch them cross the stage. I at least understood why I was paying. This time around, I paid $20 to watch the parade behind a fence that had to be at least eight feet high! Umm…so why did people have to pay to stand on the street behind a fence? Maybe it’s because I am used to being able to watch the parade of bands for free while eating from the Caribbean food vendors along the parkway in New York, but paying to watch a parade from behind a fence with only hot dogs for sale, makes me wonder what I really paid for. Although I was not a fan of the fence, I at least thought we would be able to watch the masqueraders cross the stage. No such luck. Trucks blocked the view of everyone seated or standing behind the barricades along the Lakeshore so that only the judges were able to see anything. Again, what was the purpose of the $20 fee? Thank goodness for Flash concert that night. I only wish that it was closer to downtown. The $70 one-way trek out to The Courtyard by Pearson Airport put a serious dent in my carnival funds, but the performances by Bunji Garlin, Fay-Ann Lyons, Iwer George, Patrice Roberts, Farmer Nappy, and Machel Montano made the trip worth it! While this was a great show, it was aptly named. It seemed like the performances were so hurried. I thought maybe it was my feting spirit wanting to jump all night, but no. Others left feeling slightly short-changed, too. Sunday night it was all about the highly anticipated Fire Fete. Sound Academy nightclub was packed with flag-bearing West Indians ready to party. Unfortunately, it was so packed that I couldn't even dance for two minutes before someone begged to pass through. KI and his band 3veni brought the chutney vibes with the hits "Single Forever" and "Friends for the Night." Destra, of course got the crowd to "mash up" when she performed her old hits, "Carnival" and "I Dare You" and her newer songs "Call My Name" and "Mash Up." That woman has some serious energy! I wined, I jumped, I waved, and I cheered for my country when she had the wine-off competition. Alison Hinds made me prove that I was "born with it" and "roll it" as she crooned the popular tunes. Is it just me or does that woman age slower than the rest of us? While I definitely enjoyed Destra's and Alison Hinds’ performances, it was J.W. and Blaze that made me move the most. The duo performed with such infectious energy that they could have skipped their hit "Palance" and the crowd still would have cheered. Although, it was madness when they did! The fetes were packed, the artists entertaining, and the crowds lively, but I still have a tabanca for the parade of bands from last year. I was able to see the revelers cross the stage and take photos with them in their fabulous costumes instead of peering at them through a fence like a nosy neighbor. (Of course, you know West Indians. We found a way to break through that fence.) However, my suggestion to those hoping to attend the Toronto carnival in 2014, play mas or save your money for the fetes. We got beyond the fence to bring you some great pics. Check them out here!